A preliminary design for a battleship to be funded in Fiscal Year 1917, sent on 28 March 1916 to the Navy Department as one of six alternatives. This design followed the Tennessee (Battleship # 43) in layout and speed, differing in replacing triple 14-inch gun turrets with twin 16-inch turrets while also adding a fifth twin 16-inch gun turret amidships. This design avoided the use of potentially risky triple 16-inch gun turrets but expanded ship size and complicated the design by placing magazines amidships between the machinery spaces. As such, it was one of the least desirable schemes and was passed over. 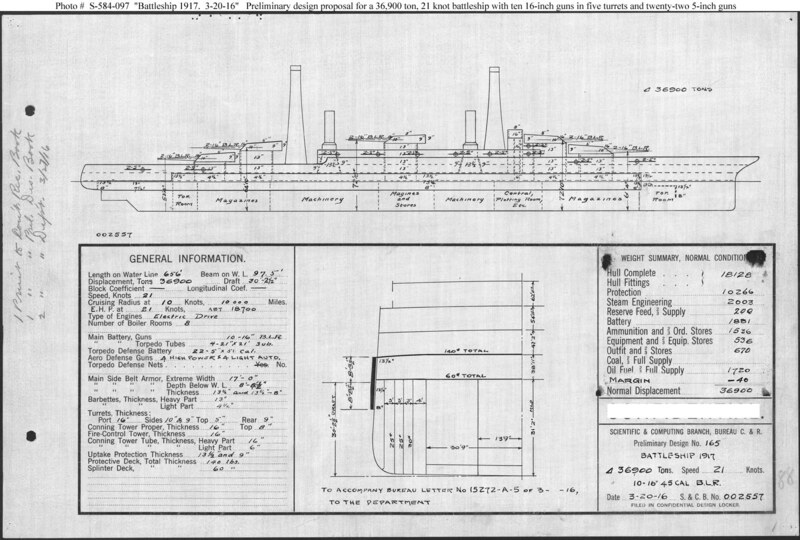 This plan provided ten 16-inch guns, electric drive machinery, and a speed of 21 knots in a ship 656 feet long on the waterline, 97 feet 6 inches in beam, and with a normal displacement of 36,900 tons.